A dog park is a park made just for dogs. They are securely fenced in, providing an area for dogs to run and play off lead. Some of them include agility style equipment, a water fountain made just for dogs, doggie clean up bags and a place for owners to lounge, such as benches and/or a pavilion. Some of them even have a small shower to cool off a dog quickly if needed. Dog parks provide a place to run for dogs that otherwise would not be able to run free, and a place for dogs to play with other dogs. Owners usually do not have to do much to get their dogs to exercise once the leash is unsnapped; the dogs take off playing with the other dogs. So long as everyone follows the park rules and abides by some basic "dog park etiquette." Dog parks are wonderful places to take your dog; that is assuming your dog has a personality that allows it to happily socialize with other dogs. It is also a great place to take a puppy for some good old socialization, so long as your pup has had all of its shots. When going to a dog park, you are responsible for your dog(s) and their actions. When going to a dog park for the first time, walk around and inspect the park. Is it safe? If you see things you do not like, leave the park and find a new one; it is your responsibility. Keep existing dog parks open by using proper dog park etiquette. Dog parks should be used as a fun place to play, but not as a means of exercise. One should walk their dogs right before coming to the park. Dogs that come to the park extremely excited, pulling ahead of their owners, with bottled up, excited energy are more likely to set off a fight between the other dogs. Even if your dog is not the one fighting, they send signals to the other dogs which put the other dogs in an unhealthy excitable state of mind. Dogs do not talk; they feel one another's energy. Have you ever been at a dog park where all the dogs were doing very well until a particular dog showed up, and suddenly the entire park seemed to be on edge with little scuffles here and there? One dog can feed unstable energy to the entire pack. Some dogs, plain and simple, do not get along with other dogs. If you have one of these types of dogs, do not bring him to a dog park until you have worked on your dog's aggression issues.If your dog is OK with other dogs sometimes, but you’re not too sure, keep your dog on a leash until you are able to feel your dog out. If he shows signs of wanting to fight or dominate other dogs, leave the park. If your puppy has not had all of his shots, do not bring him to a dog park. Not only are you exposing your own dog to sicknesses he may not be vaccinated against, but you are putting other dogs at risk. Wait until your pup is fully vaccinated before bringing him to a dog park. Do not bring dogs with fleas, mange or any other contagious parasite. Do not bring dogs with any type of contagious illness. If your dog is coughing or does not seem to be feeling good, if you are aware of a contagious illness, or if he shows any signs of being sick do not bring him until he is feeling better or has been vet checked and has the OK from a vet that he is not contagious to other dogs. If your dog poops, clean it up ASAP before another person or dog steps or rolls in it. Know your park; if they do not provide clean-up bags, bring your own. Make sure you always have bags on hand in case your park ever runs out of them. If your female dog is in heat, it is not a good idea to bring her to a dog park. She'll have a ton of male dogs chasing her. It will not be fun for you, your dog or the other owners. Dogs are more likely to be aggressive if they have mating on their mind. If your male dog is not neutered, he may constantly try and mount other dogs. If you notice this happening over and over again, you should remove your dog from the park. Some people have a lot of dogs at home. It is not a good idea to bring more dogs than you can handle at one time. If you want to bring all of your dogs to the park, bring a friend or two to help you. It is not wise, or considerate, to bring animals other than dogs to a dog park. Many people own hunting dogs, or other types of dogs that are not good with non-canine pets. Be considerate to these types of dogs and leave other pets at home. Do not bring food into the park. Some dogs are on strict diets and if you sit down and try to eat your lunch, not only may you get another dog sick if he sneaks or steals a piece, you may have more dogs than you can safely shooe away. Food sometimes turns otherwise happy dogs a bit aggressive and overbearing. Don't spoil it for owners who bring their dogs to the park to exercise by tempting them to sit and hang out for a piece of your lunch. Dogs can do THAT at home. Be considerate; if you are hungry, eat before you get to the park or after you leave. Pay attention and watch your dog(s). It is not fair to other owners if you sit and chat and do not pay attention to what your dog is doing. Everyone is responsible for their own dog’s actions. If your dog digs a hole, fill it back in. If your dog gets into a fight with another dog, get over there and break it up pronto. If your dog is having a bad day and is picking fights with other dogs, take him home. Do not allow your dog to mount other dogs. You are responsible for your dog’s behavior. When entering or leaving the park, take extra caution not to let anyone else's dog out of the park's safely fenced-in area. Keep your leash handy at all times in case you need to get your dog under control quickly. Even if your dog may not pick a fight, another dog may. You need to be on guard and ready. After all, this is an open park with many strange dogs, a lot of them meeting for the first time. Do not litter inside the dog park. Besides the fact that littering is just plain old rude to the earth, dogs may ingest your litter making them sick. YES, cigarette butts are LITTER! Dispose of your litter properly. Know your dog and his limitations. Watch for any signs of aggressiveness and deal with your dog accordingly. Follow all of the park’s rules. Failure to follow your local park’s rules could result in fines or may cause the park to close down. Be considerate; keep your local dog parks open and safe. A well-constructed dog park has a double-gated entrance which allows an owner to walk in without letting other dogs out. This well-designed water fountain has a low fountain for dogs, with a high "ON" button for the owners to press, a medium fountain for smaller people, and a higher fountain for adults. Pushing the fountain’s "ON" button so this pup can get a drink. 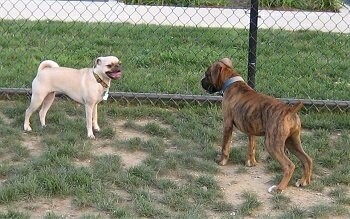 Bruno the Boxer puppy's first day at the dog park! What fun! Since Bruno has had all of his shots, he can now go to the dog park! What great fun! He thoroughly enjoyed playing with the 25-30 dogs. What a great place for socialization. It was fun to watch the high-energy dogs chase one another back and forth over and over. You could just see the endless amounts of energy in them. It was easy to see why their owners made regular visits to the park. One owner told me he visits the park every day so his two Golden Retrievers will sleep at night. We had brought Bruno's blue squeaky ball and that apparently was a great hit. It went from dog to dog. Everyone enjoyed the blue ball. There were quite a few tennis balls at the park as well, but apparently there was something special about the blue ball that made dogs want that one. 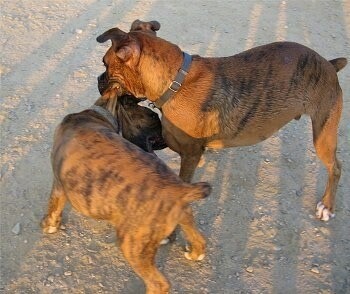 While Bruno enjoyed all of the dogs, one of his personal favorites was a six-month-old brindle Boxer named Jackson. Jackson looked so much like Bruno I was getting them mixed up, even though Jackson was much bigger than Bruno. It was cool to see Jackson playing with Bruno in the same fashion and style that Allie, our older Boxer plays—the way they use their paws while growling a playful growl, leaping from side to side, playfully biting on one another's necks. Another favorite for Bruno was Reese, an F1b Puggle hybrid. Reese's owner told me it was her first time at the park as well. Reese was having issues with being afraid of people and other dogs. After being at the park for a while, however, I could see Reese really snapping out of her shell. At first Reese's tail was between her legs, but after being chased and pawed at by Bruno for ten minutes Reese decided this was fun. Another one of Bruno's favorites...Jackson the Vizsla. These two were having a blast! 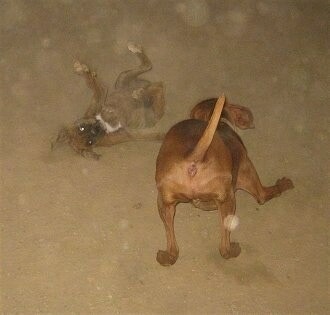 This is Bruno rolling across the dirt while Jackson the Vizsla is about to make another speedy pass over Bruno. These two were really kicking up the dust. "It's getting dark, time to leave, but not before I try one last time to catch this Vizsla! "Not a chance! Jackson the Vizsla is just way too fast. Jackson kept running back and forth at lightning speed. Jackson is very playful and friendly, with more energy than he knows what to do with. When we left Bruno was all dirty and extremely tired.